Smoking rates are declining in New Zealand as more and more people are successfully quitting. However, rates remain unacceptably high among deprived communities, Māori and Pacific peoples and in people with mental health disorders. It is often helpful to think of smoking as a chronic relapsing disease, thereby acknowledging the difficulties of smoking cessation and the likelihood of relapse. Ideally, health professionals should be providing smoking cessation support in the ABC format to every patient who smokes, at every consultation. It is also important to individualise cessation support by understanding why a patient’s previous quit attempts have failed and encouraging a wave of social support for future attempts, particularly in groups with high rates of smoking. 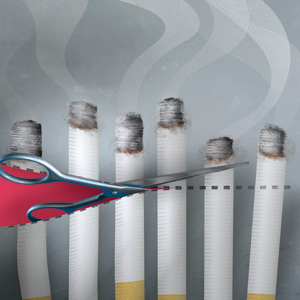 Health professionals who are able to do this increase the chances that patients will be able to stop smoking long-term. In New Zealand, smoking rates are falling; daily smoking among all adults was 18.3% in 2006/07, 16.4% in 2011/12 and most recently, 15.5% in 2012/13.1 However, smoking is analogous to a chronic disease with frequent relapses, and ongoing work is required to continue this downward trend in the number of people who smoke. Tailoring support to patients by understanding their quit-history and circumstances means that health professionals can increase the chances of the patient’s next attempt succeeding. It is important to let patients who are quitting know that it is likely that they will lapse. However, behavioural support, e.g. Quitline, and pharmacological smoking cessation aids, do help prevent a lapse in abstinence becoming a return to regular smoking. “When was the last time you smoked a cigarette?” is a non-judgemental way of enquiring about smoking status in patients who are known to be smokers. For people whose social life is restricted to family/whanau and neighbours, a fear that quitting smoking can result in being “left-out” socially is a barrier to quitting.12 Concerns that giving up smoking will cause illness are also not uncommon, e.g. coughing or chest infections following quitting. Other barriers to quitting smoking that are frequently reported include: fear of weight gain, boredom and the timing of a quit attempt being problematic.12 A patient’s individual concerns about quitting need to be addressed when discussing smoking cessation. People who smoke often view it as a stress-relieving activity, therefore do not want to quit.12, 14 There may also be concern that quitting smoking will worsen mood in people with a mental health disorder.14 In fact the opposite is more likely to be the case: smoking cessation has been shown to have beneficial effects on mood disorders, with an effect size equal to, or larger than, treatment with antidepressants.14 Health professionals should acknowledge that a patient’s mood may improve in the minutes after smoking a cigarette. However, this is an opportunity to explain to the patient that the reason they feel better is because they are addicted to nicotine, and that every puff continues this cycle (see: “Why does quitting smoking improve mental health?”). The patient can then be reassured that all people who break the cycle of smoking addiction will experience mental health benefits.14 N.B. The doses of antipsychotics used to treat some mental health disorders (and insulin) may need to be adjusted if abrupt cessation occurs in a person who is heavily dependent on cigarettes (see: “The effects of smoking cessation on patients with mental health disorders). Why does quitting smoking improve mental health? It is important that cessation support, e.g. referral to smoking cessation service, should be offered to all people who smoke without assessing their readiness to stop smoking. Only offering cessation support to people with a stated desire to quit smoking is a missed opportunity for positive change. Also see: “A review of pharmacological smoking cessation aids”. A meta-analysis of the effect of cessation support found that offers of cessation support by health professionals, e.g. “If you would like to quit smoking I can help you do it”, motivated an additional 40 – 60% of patients to stop smoking within six months of the consultation, compared to being advised to quit smoking on medical grounds alone.4 It is important to note that the motivation of patients to stop smoking was not assessed before offers of cessation support were made. Quitline is a smoking cessation service which offers phone-based support, six days a week (Monday – Friday 8 am – 9.30 pm, Sunday 10 am – 7.30 pm on 0800 778 778) to all people who want to quit smoking. People can self-refer to Quitline or they can be referred by a health professional. Patients can also be referred electronically if the relevant feature is enabled on the practice management system. Txt2Quit support is available from Quitline directly to mobile phones. Aukati Kai Paipa is a free smoking cessation service that delivers face-to-face coaching for Māori from over 30 centres around New Zealand. Smokefree Communities offers smoking cessation services to people living in the North Shore, Waitakere and Rodney areas. Programmes focus on reducing rates of smoking among women who are pregnant and their whanau/family, Asian people and their families, and all families with children aged under 16 years. Smokefree Communities provides support in Chinese, Korean, Burmese and Hindi/Fiji Hindi languages. Health professionals can discuss strategies with patients to help manage triggers where there is extra pressure to smoke. For example, focus on something that is important to the patient and incorporate it into a response that they use to decline an offer to smoke, e.g. “No thanks, my daughter has asthma – our home is now smokefree to help her breathing get better”. Encourage the person quitting to reach out for assistance from anyone they know who has previously quit smoking. Peer support for people who are attempting to quit smoking can take many forms. The rationale is that a person with similar life experiences to the person who wants to stop smoking can provide practical tips that fit with their lifestyle. A friend or family member is also more likely to have regular contact with the person attempting to quit. Examples of peer support might be having a coffee or tea together each morning to discuss any difficulties or temptations, or attending situations together where there may be a strong temptation to smoke, e.g. the pub. There is some evidence that peer support may be more successful when people in deprived communities attempt to quit smoking, compared with people in the general population.17 Some maraes in New Zealand have also run competitions that both challenge people who are quitting smoking to stay smokefree while also supporting each other’s quit attempts. The Quitline Blog is the most popular online smoking cessation peer support forum operating in New Zealand. People who are attempting to quit smoking can be encouraged to access this forum to receive support at any time of the day or night. Social networking platforms, e.g. Facebook, can also be used to provide a substitution for social situations where the person has previously found it difficult to resist the temptation to smoke. Social networking is more likely to be used by younger people who smoke and have regular access to the internet. At a cost of $20, a pack-a-day smoker would be spending $140 a week, or more than $7000 per year on cigarettes. The money that a family/whanau can save by quitting smoking can, and should, be used to create goals that unite families in their desire to be smokefree. For example, as well as spending the extra money on essentials such as clothing, a small weekly treat such as going to the local swimming pool can provide an ongoing and tangible incentive to being smokefree. Longer term goals such as saving for a family holiday can also create family “buy-in” and may help parents remain abstinent from smoking in the months following their quit date. What to do if the patient does have another cigarette? If a patient who is attempting to quit reports that they have had a brief smoking lapse then it is important that they do not see this as a failure. Support is required to help them avoid feelings of guilt and loss of control that can undermine their quit attempt. Remind patients that many people who quit experience lapses. Encourage the patient to continue to use NRT and any other smoking cessation medicines that have been prescribed. Ask the patient to again commit to “not one puff” onwards and to ensure that cigarettes, lighters and ashtrays have been discarded. Pharmacological aids for smoking cessation can reduce nicotine cravings and lessen withdrawal symptoms. An offer of medical assistance may embolden people who have previously attempted to quit smoking without support to try again. Pharmacological aids also reduce the likelihood of a lapse in abstinence becoming a return to long-term smoking. The important factors to consider when discussing smoking cessation treatment options are the patient’s preferences and previous experience of smoking cessations aids, the patient’s likely adherence to treatment and the possibility of any adverse effects. The use of NRT approximately doubles the likelihood of a person being able to quit smoking long-term; one in 14 people who would not otherwise have stopped smoking will do so for at least six months following a course of NRT.15 Several studies suggest that in people who are unmotivated to quit within the next month, the use of NRT results in an increased number of quit attempts and marginally higher rates of abstinence.21 NRT may therefore act as a quit catalyst for patients who smoke and who report that they are not yet ready to stop.21 Offering patients who smoke the opportunity to trial different forms of NRT before they attempt to quit may also improve their choice of NRT and result in better treatment adherence. Subsidised NRT can be prescribed by general practitioners and registered Quit Card Providers. Subsidised supplies of NRT may also be obtained by general practices using a Practitioner Supply Order. Pharmacists can supply subsidised NRT that is prescribed on a normal prescription (maximum quantity 12 weeks) or a Quit Card (maximum quantity 8 weeks) at a cost of $5; these will be dispensed in four-week quantities. Pharmacists are not able to prescribe subsidised NRT unless they are part of a special regional programme, e.g. Canterbury DHB. Nicotine patches are fully subsidised in New Zealand and available in 7mg, 14 mg and 21 mg patches. These should be pressed in place on dry, clean and hairless skin, and replaced daily.22 Patches may cause some dermal erythema.22 If patients report disturbed sleep while using nicotine patches then they should be removed at night. Nicotine lozenges are available in 1 mg and 2 mg formulations. It is recommended that lozenges be used regularly when nicotine cravings occur.22 The 2 mg formulation is indicated for people who are highly dependent on tobacco, i.e. smoking within an hour of waking. All people who wish to quit smoking can use NRT, including people with cardiovascular disease and women who are pregnant or breastfeeding, if they would otherwise continue to smoke.22 When discussing the use of NRT with a woman who is pregnant or breastfeeding perform a risk assessment and consider “Can she quit without NRT?” If not, NRT is safer than smoking. A study involving over 1700 pregnant women who used NRT found no significant association between NRT use and decreased infant birth weight.24 Pregnant women who are using nicotine patches should remove them overnight.22 Adolescents aged 12 years or over can also be prescribed NRT,22 however, the use of NRT alone is unlikely to address the reasons why an adolescent has begun, and continues to smoke. Medicines for smoking cessation should be prescribed in combination with behavioural support, e.g. Quitline, to improve their effectiveness.10 Table 1 provides a comparison of smoking cessation medicines subsidised in New Zealand. 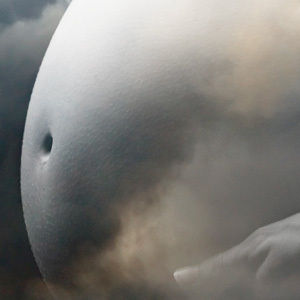 In general smoking cessation medicines should not be used by women who are pregnant because the potential risk to foetal development cannot be balanced against the known benefits of smoking cessation.15 Some smoking cessation medicines may not be appropriate for patients with a history of mental disorders. Lowers seizure threshold and should not be taken by patients with acute alcohol or benzodiazepine withdrawal, CNS tumour, eating disorders, bipolar disorder, use of monoamine oxidase inhibitors (MAOI) in the last 14 days, and in patients with severe hepatic cirrhosis. None, however, patients and their family/whanau should be vigilant for changes in behaviour, thinking or mood, in particular depression and suicidal ideation. If this occurs cease taking the medicine and seek medical advice immediately. In general, bupropion is considered to be a safer medicine than nortriptyline. One in a thousand patients are expected to have a seizure over the course of treatment.25 Use with caution in patients taking antipsychotics due to increased seizure risk. Skilled tasks, such as driving, may be impaired. In general, nortriptyline should be used with caution in patients thought to be at an increased risk of suicide, or who have a history of psychosis. Levels of nortriptyline can be increased by two to four-fold, or occasionally more, by the concurrent use of fluoxetine; in this situation nortriptyline dose reductions of 75% have been suggested. Initiate one to two weeks before quit date with one 150 mg bupropion tablet, daily, for three days, then 150 mg, twice daily. The maximum single dose is 150 mg bupropion, and the maximum daily dose is 300 mg bupropion. Treatment is usually for seven weeks. For people with risk factors for seizures or in elderly patients the maximum daily dose is 150 mg bupropion. Initiate ten to 28 days before the agreed quit date with nortriptyline 25 mg, daily, gradually increase over ten days to five weeks to 75 – 100 mg nortriptyline daily, for up to three to six months. The dose should be slowly tapered while treatment is withdrawn. Initiate one to two weeks before the quit date, at 500 micrograms varenicline, daily, for three days, increased to 500 micrograms varenicline, twice daily, for four days, then 1 mg twice daily for 11 weeks. The 1 mg dose can be reduced to 500 micrograms if it is not tolerated. This course can be repeated to reduce the risk of relapse. * Subsidy status correct at the time of printing. Check the New Zealand Formulary for latest information. Electronic-cigarettes are a topic in smoking cessation that is evolving rapidly, both in terms of device design and evidence of effectiveness. The devices electronically vaporise a solution made up of propylene glycol and/or glycerol, nicotine and flavourings, that users inhale rather than burning tobacco leaves.26 The solution is held in cartridges that are inserted into the device.26 These devices are different to nicotine inhalators. The body of research on electronic-cigarettes is small, but growing quickly, and opinion is divided as to the potential harms or benefits to personal or public health.27 Currently, no electronic cigarette products have been approved under the Medicines Act for sale or supply in New Zealand and therefore it is illegal to sell an electronic-cigarette that contains nicotine.26 It is also illegal for electronic-cigarettes, with or without nicotine, to be sold as smoking cessation aids, or for an electronic-cigarette that resembles a tobacco product to be sold to a person under the age of 18 years.26 However, electronic-cigarettes are available on international websites as smoking cessation aids and many people who smoke are interested in using them for that purpose. Both the Ministry of Health and WHO recommend that people who smoke should be encouraged to quit using a combination of approved NRT products, i.e. patches, lozenges and gum.26 The Ministry of Health intends to assess new evidence as it arises regarding the safety and appropriateness of the use of electronic-cigarettes as smoking cessation aids. Thank you to Dr Brent Caldwell, Senior Research Fellow, Department of Medicine, University of Otago, Wellington, Dr Marewa Glover, Director of the Centre for Tobacco Control Research, University of Auckland and Dr Hayden McRobbie, Senior Lecturer, School of Public Health and Psychosocial Studies, Auckland University of Technology, Consultant, Inspiring Limited for expert guidance in developing this article. Ministry of Health. New Zealand Health Survey: Annual update of key findings 2012/13. Wellington: Ministry of Health 2013. Available from: www.health.govt.nz/publication/new-zealand-health-survey-annual-update-key-findings-2012-13 (Accessed Oct, 2014). Borland R, Partos TR, Yong H-H, et al. How much unsuccessful quitting activity is going on among adult smokers? Data from the International Tobacco Control Four Country cohort survey. Addiction 2012;107(3):673–82. Hughes JR, Keely J, Naud S. Shape of the relapse curve and long-term abstinence among untreated smokers. Addiction 2004;99(1):29–38. Aveyard P, Begh R, Parsons A, et al. Brief opportunistic smoking cessation interventions: a systematic review and meta-analysis to compare advice to quit and offer of assistance. Addiction 2012;107(6):1066–73. Morton S, Atatoa C, Bandara D, et al. Growing up in New Zealand: A longitudinal study of New Zealand children and their families. Report 1: Before we are born. 2010. Available from: https://researchspace.auckland.ac.nz/handle/2292/6120 (Accessed Oct, 2014). 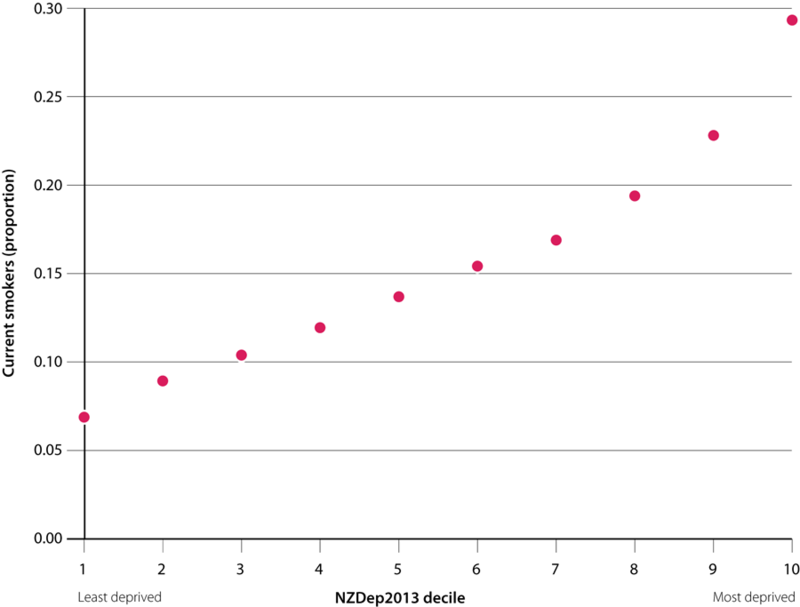 Atkinson J, Salmond C, Crampton P. NZDep 2013 Index of Deprivation. 2014. Available from: www.otago.ac.nz/wellington/otago069936.pdf (Accessed Oct, 2014). ASH: Action on smoking and health. Māori smoking: fact sheet. ASH, 2014. Available from: www.ash.org.nz/wp-content/uploads/2014/01/Māori_smoking_ASH_NZ_factsheet.pdf (Accessed Oct, 2014). Quitline. Quitline client demographics - quarterly reports April - June 2014. Available from: www.quit.org.nz/68/helping-others-quit/research/quitline (Accessed Oct, 2014). ASH: Action on smoking and health. Pacific smoking: factsheet. ASH, 2014. Available from: www.ash.org.nz/wp-content/uploads/2013/01/Factsheets/10_Pacific_smoking_ASH_NZ_factsheet.pdf (Accessed Oct, 2014). Zwar NA, Mendelsohn CP, Richmond RL. Supporting smoking cessation. BMJ 2014;348:f7535. The Royal New Zealand College of General Practitioners (RNZCGP). Tobacco position statement. RNZCGP, 2013. Available from: www.rnzcgp.org.nz/position-statements-2 (Accessed Oct, 2014). Research to support targeted smoking cessation: Insights on how to encourage people living in high deprivation communities and/or Māori people to quit smoking. Quitline, 2014. Available from: www.quit.org.nz/file/research/2014/research-summary-report-25-july-2014website.pdf (Accessed Oct, 2014). Mullen PD. How can more smoking suspension during pregnancy become lifelong abstinence? Lessons learned about predictors, interventions, and gaps in our accumulated knowledge. Nicotine Tob Res 2004;6 Suppl 2:S217–38. Taylor G, McNeill A, Girling A, et al. Change in mental health after smoking cessation: systematic review and meta-analysis. BMJ 2014;348:g1151. Ministry of Health (MOH). New Zealand smoking cessation guidelines. MOH, 2007. Available from: www.health.govt.nz (Accessed Oct, 2014). UK Medicines Information. Which medicines need dose adjustment when a patient stops smoking? 2012. Available from: www.evidence.nhs.uk (Accessed Oct, 2014). Ford P, Clifford A, Gussy K, et al. A systematic review of peer-support programs for smoking cessation in disadvantaged groups. Int J Environ Res Public Health 2013;10:5507–22. Smokefree Coalition. Quitting tobacco would reduce poverty: media release. 2013. Available from: www.sfc.org.nz/media/131211-quitting-tobacco-would-reduce-poverty.pdf (Accessed Oct, 2014). Waikato DHB. Waikato picks up incentive programme for smokefree pregnancies. 2014. Available from: www.waikatodhb.health.nz (Accessed Oct, 2014). Auahi Kore. Counties Manukau smokefree pregnancy incentives pilot. Available from: http://smokefree.org.nz/counties-manukau-smokefree-pregnancy-incentives-pilot (Accessed Oct, 2014). Carpenter MJ, Jardin BF, Burris JL, et al. Clinical strategies to enhance the efficacy of nicotine replacement therapy for smoking cessation: a review of the literature. Drugs 2013;73:407–26. Ministry of Health (MOH). Guide to prescribing nicotine replacement therapy. MOH, 2014. Available from: www.health.govt.nz (Accessed Oct, 2014). Lassen TH, Madsen M, Skovgaard LT, et al. Maternal use of nicotine replacement therapy during pregnancy and offspring birthweight: a study within the Danish National Birth Cohort. Paediatr Perinat Epidemiol 2010;24:272–81. Hughes JR, Stead LF, Hartmann-Boyce J, et al. Antidepressants for smoking cessation. Cochrane Database Syst Rev 2014;1:CD000031. Ministry of Health (MOH). Electronic Nicotine Delivery Systems (ENDS), including E-cigarettes. MOH, 2014. Available from: www.health.govt.nz (Accessed Oct, 2014). McNeill A, Etter J-F, Farsalinos K, et al. A critique of a WHO-commissioned report and associated article on electronic cigarettes. Addiction 2014;[Epub ahead of print]. WHO Famework Convention on Tobacco Control. Electronic nicotine delivery systems: WHO, 2014. Available from: http://apps.who.int/gb/fctc/PDF/cop6/FCTC_COP6_10-en.pdf?ua=1 (Accessed Oct, 2014).